This Patriotic Feather Banner Stands 14 Feet Tall! This Swooper is Economically Priced. This Patritoic Feather Banner is In Stock Now! Single printed side dyed-through (mirror image on backside) for a highly visible flag. 4-Piece aluminum flag pole for portability and a low price point. 14' Height with a red, white and blue streamer graphic perfect for establishing presence. Patriotic Feather Banner- "Flag Banner Pattern"
This patriotic feather banner that includes a flag pole kit has everything needed for quick and easy setup. This advertising swooper is great for promotional events at retailers, or even for fourth of july sales! This patriotic feather banner is made of knit polyester for a long lasting and brightly colored display. This advertising display is a great tool for businesses to grab attention of passerby customers whether in car or on foot. This bow flag, patriotic feather banner that is economical is an affordable advertising tool that provides maximum visibility. This patriotic feather banner that is for outdoor use is designed for the flag to always be visible and will not curl in the wind. This advertising signage is ideal for use during special events and promotions to increase customer awareness. This patriotic feather banner is brightly colored to attract attention and new business. These swoopers are 27" wide by 142-1/2" tall so the pre-printed graphic is large and highly visible. This American patriotic feather banner, also known as a swooper flag, includes a metal ground spike that can be reused. 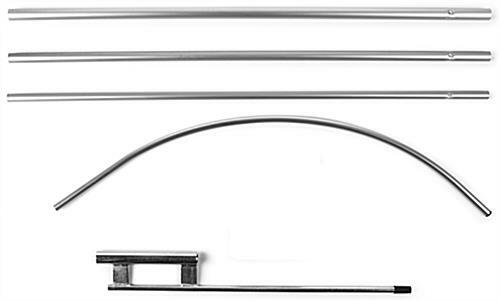 The aluminum pole included with this kit breaks down into four pieces. This patriotic feather banner is more economical than comparative flags due to the use of the aluminum poles. 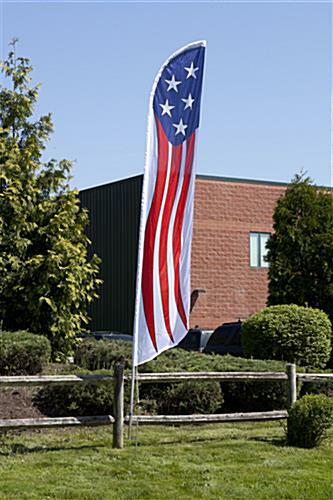 Although fiberglass flag poles are more heavy duty than aluminum, there are many benefits to this economical option. This patriotic feather banner pole is lightweight making it more portable. This stars and stripes patriotic feather banner flows in the wind. This patriotic feather banner boasts a stay open design so the print is visible with or without wind. This display is highly visible and meant to draw in attention from potential customers.